The picture of the nearly century old Indian gooseberry tree (amla in Hindi and nellikai in our native language Kannada) that stood tall in the courtyard of my grandparents home in Siddapur, Karnataka will always be fresh in my mind. It was the tree that witnessed all the weddings of my uncles and aunts, the births of many grandchildren and the numerous festivals and celebrations that took place in the family. It was also in this courtyard that we cousins played games, running from pole to pole until we were exhausted and the calls for dinner arrived and the thoughts of the delicious south Indian havyaka brahmin food that was going to be served was one of the things that could make us move from this cosy place. And it was this same tree that stood witness to all our games filled with fun and frolic, our fights and disappointments too! 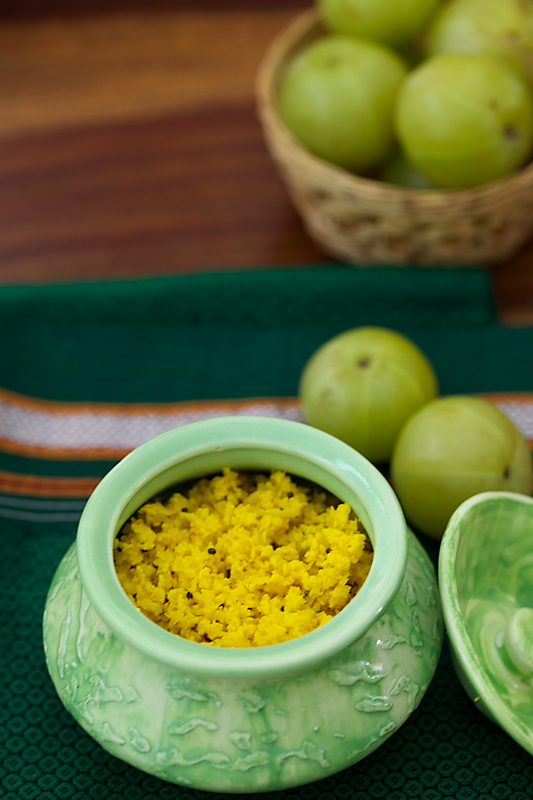 The fruit of the tree the nellikai or amla which strongly contrasts the fruit available in the market these days was made into savoury pickles, chutneys and sweet relishes by ammamma( my grandmother). 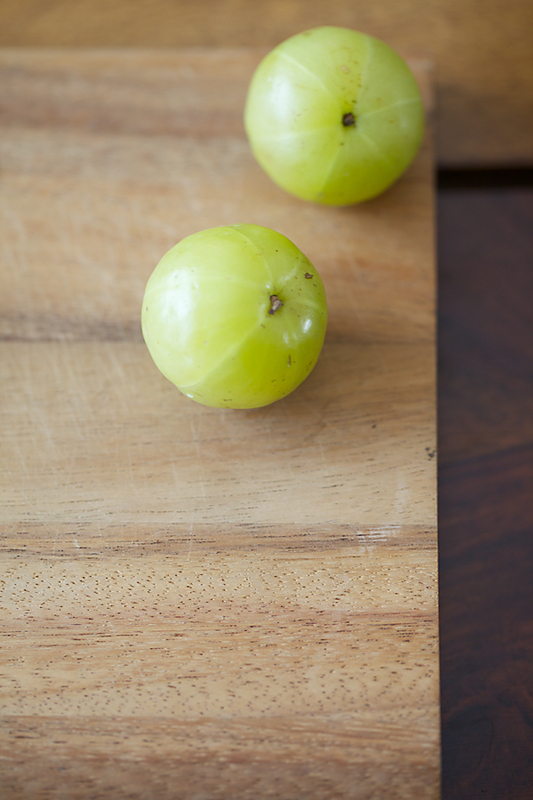 With its rich Vitamin C contents and other healing attributes, the amla chutney recipe that I’m sharing with you today is very close to my heart and has enlivened many of my meals with zest and comfort. 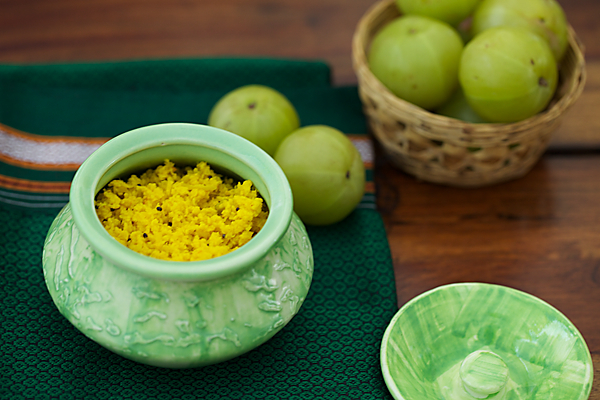 Amla is known to be an antidote to many winter maladies like coughs and colds. 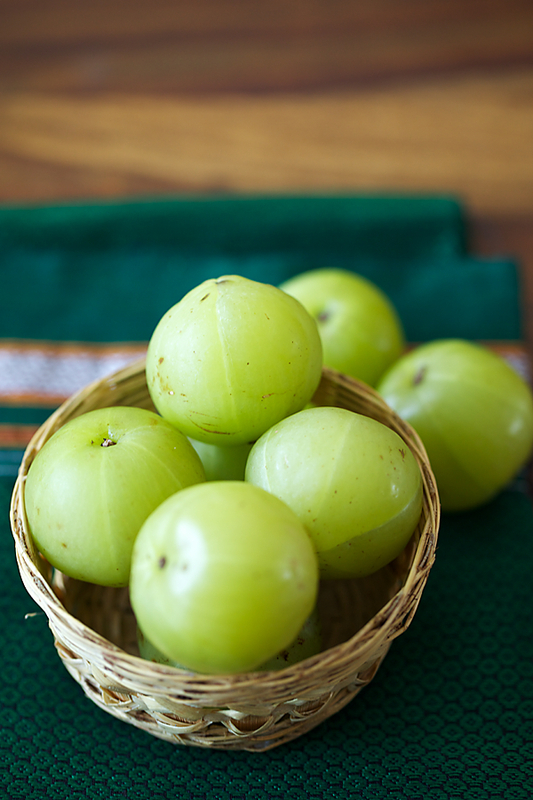 According to Ayurveda, the amla fruit (derived from the sanskrit name “amalika”) has five tastes sour and astringent and sweet, bitter and pungent secondary tastes. The salt in chutneys provides the sixth taste to complete the taste cycle. This chutney is sour, salty and slightly hot and is a great accompaniment to most south Indian dishes and even rotis and parathas. One of my favourite ways of eating this is with plain hot rice at times mixed with a dollop of ghee or coconut oil. I recently had an unexpected guest for lunch with zero notice and I served him hot rice, sambar, some papad, buttermilk and this chutney and he went back a happy man. And ofcourse he couldnt stop himself from taking second and third helpings from my chutney jar! If you dont want to use green chilies, substitute it with red chili powder. Lightly roast the fenugreek seeds in a heavy bottomed iron skillet or wok. Crush to a powder with a mortar and pestle. Heat the oil in a wok over a medium flame and put in the mustard seeds. When they pop lower the flame and add the asafetida, turmeric powder, greenchilies and fenugreek in quick succession. Turn off the heat after 30 seconds or else the turmeric will go black and the fenugreek seeds will turn bitter. 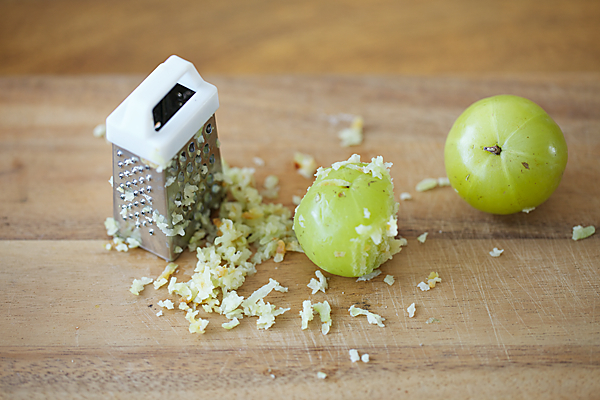 Stir in the grated amla and salt. Allow to cool, put in an air tight container and store in the refrigerator for upto a month. Happy New Year ! May 2013 bring in all your heart's wishes, good health and prosperity to you and your family. Your recipes are so reliable, Thank you very much. I have been waiting since last Diwali for a boondhi ladoo recipe from you ( the typical brahmin style big ladoos) as Iam so sure that your family makes them in plenty, for weddings and festivals alike. Really looking forward 🙂 Awaiting your posts. hey this is my fav as well …. will surely try ..
Simi: How true! This recipe is however my mother in laws and is not made in Siddapur! Chinmayie: Hope you like it! Ruchika: Thanks and new year wishes to you as well! Will add your recipe request to my recipe request list! Anita: New year wishes to you too. 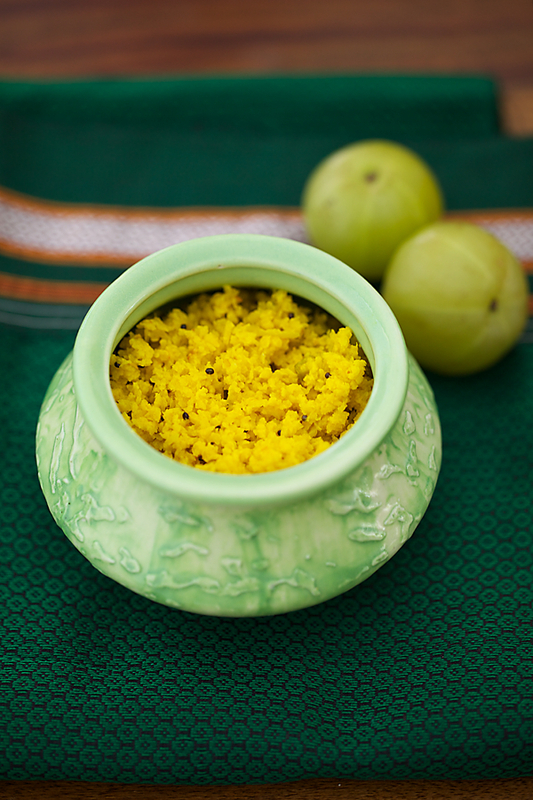 Boondi laddu was definitely a part of big family celebrations in our family but were made by professional brahmin cooks in quantities like 2500 to 3000 laddus. After, English Vinglish the demand for these laddus seems to have gone up! 😉 Will try and post a recipe for the same! Sheenu: Let me know how you like it! I made this chutney last week. Its yummy! I like trying out your recipes, they are simple and tasty. You always have the most amazing ingredients. The dish looks beautiful! This recipes of ur's is pretty easy and sounds n looks very much palatable… hmmm yummy!!! I am definitely going to give it a try very soon. I have tried many of your cake / bake recipes, but not able to get the right portions/ measurements or is it my microwave causing any problems not sure. My trials have not turned out to be perfect like yours.. :(. Anita: Thank you for the feedback. Nithya: I never use a microwave oven and my recipes are not designed for them either but there are quite a few people who have baked my recipes in a microwave with great success. Can we use frozen amla inplace of the fresh ones? I want to try this recipe and I only have frozen Amla. Anjali: You are right..since this chutney is not cooked, the nutrition remains intact. I'm happy you are here too. I got fresh gooseberries from the market today and was checking google for chutney recipes when I came across this page. I'm going now immediately to try this out. Can we store this chutney for a few days if we add coconut? Suman- The shelf life decreases if we add the coconut. You cannot preserve it for a long time. I was searching for the amla chutney recipe and then I came across to read your blog.You really post very healthy food recipes that are tasty as well as easy to make. Roopa- Thanks for remembering me. My ancestors are from North Canara district. The Siddapura you are referring to is in South Canara. Loved this recipe, so simple yet tasty! Thanks Anu. Priya- Great to know that! Thanks for sharing.